Back out on to the marsh at West Kirby yesterday morning for some more early morning manoeuvres. Breakfast was 4 (yes 4!) slices of hot buttered doorstep white toast from a well known local bakery washed down with an extra large caramel latte. I added 2 more species to the Breakfast Club on a morning identical in its vibrancy and brilliance to Sunday. Wheatears not playing the game today so no more pictures of them. 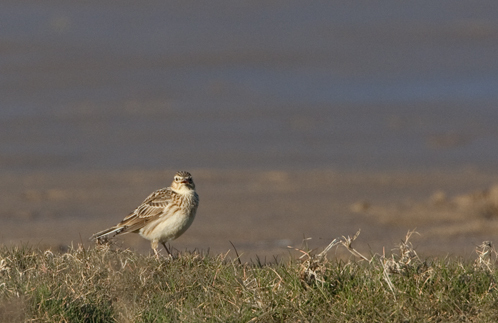 However, this gave me the opportunity to concentrate on the Skylarks that I had so rudely ignored 24 hours previous. If the Wheatears had put on a show on Sunday morning then the Skylarks had provided a wonderful soundtrack. So I decided to try for them. Not as easy as I had thought it would be either. 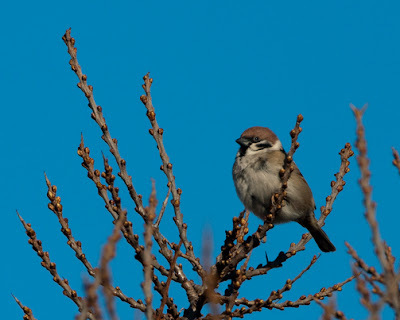 The first I hear singing is doing so from cover rather than as it rose above its territory. The day is clear and still so the sound of it's song wafts stongly over the marsh. Suddenly, lift off! Too fast to follow with the big lens I'm wielding and when I do fix it in the viewfinder the autofocus can't keep up either. 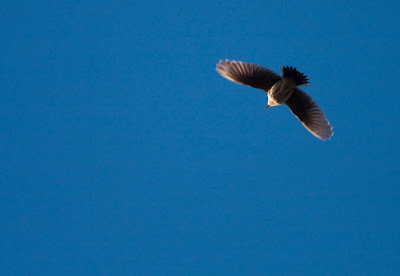 It rises on uneven wingbeats calling all the time. Hard to pick out of the endless blue. Sunlight streaming through quivering wings, quite a sight. The only crimp in the scene are the toast crumbs I've managed to drop into the left eyecup of my binoculars, a situation I make worse with a greasy finger as I try to rectify the problem. I wander on supping the last of the now luke warm latte. I decide to walk all the way to Red Rocks to work off my not so healthy breakfast. I crush a crust and drop it off the path so the newest member of the Breakfast Club can share it. As I drift on I pass through at least 3 more territories, firing off a few pictures of each male. They watch me as I pass, almost escorting me off their respective patches before resuming the mornings soundtrack. Getting close to the end of Stanley Road I notice a couple of small birds in a tree in a back garden. The light is really good so I decide a few frames of whatever species the distant specks are will be worthwhile. 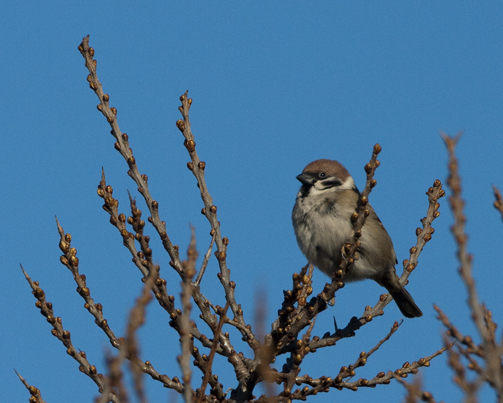 To my surprise the 2 dots turn into Tree Sparrows when magnified through the telephoto lens! Bonus for the year list and the 5th member of the Breakfast Club! They don't hang around for long, heading off towards King's Gap. That's my cue to leave too. I head back along the boardwalk stopping to check the ponds for frogspawn. There is a small blob of spawn close in.